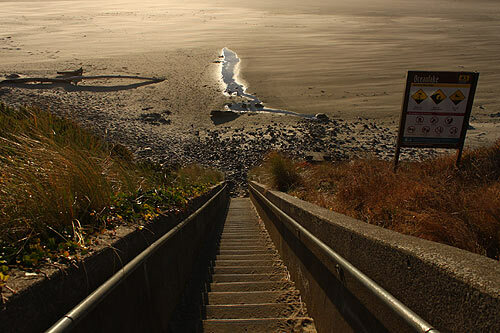 (Cannon Beach, Oregon) – From Cannon Beach down to Newport, it's roughly a 120-mile drive, and where you cross that threshold between what is known as the north coast and the central coast. Along the way, the wonders are numerous. It's literally a huge array of memorable moments. (Above: Bayocean, near Oceanside and Tillamook). This is something not lost on Portlander Andy Marshall, who admits he can't really think of a favorite Oregon coast hangout, except for just about everything along that stretch. Even a list of highlights along this wondrous way would be too enormous. But a sampling of eight amazing finds? Well, that's doable. 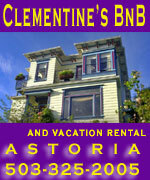 Click on the links for the virtual tours of these areas as well as maps. Hug Point. 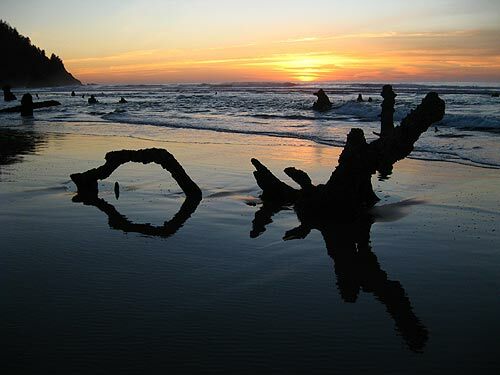 A mere three miles south of Cannon Beach sits this intriguing state park full of all sorts of complexities and delights. A steep downhill parking lot leads you first to a wide open view of ocean, sand and rocky blobs and cliffs. Sometimes, the tide won't allow you to go much farther than what is this mini-cove in front of you, but that's often enough. On the northern side of the cliff you'll encounter an especially beautiful waterfall, a few cave-like indentations and then an actual cave which is downright hypnotizing and a bit mind-bending, maybe even a tad spooky. Another big highlight here is the old road going around the point, from back in the early 1900's when the beaches were Oregon coast's only highways. There's even a remnant of an old traffic light embedded there. Neahkahnie Overlooks. Just before rounding the bend to soft-spoken Manzanita, you'll find a stunning viewpoint where it seems you can see forever. Indeed, on a clear day you can see 40 miles to the south and the structures of Oceanside and Bayocean. Hiking trailheads to the 1600-foot summit of Neahkahnie Mountain are about a quarter mile to the north and the south of the big parking lot. 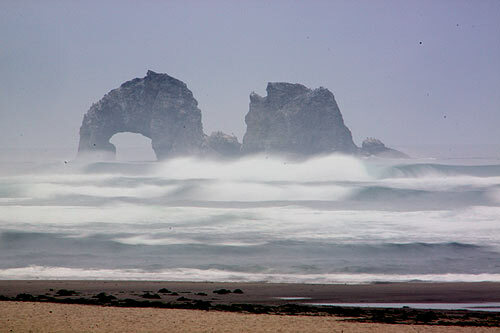 Twin Rocks of Rockaway Beach. One of the Oregon coast's more legendary landmarks are these ancient basalt beauties, who don't look a day over 65 million years (back when they were part of a lava flow so intense it burrowed underneath the sediment and popped up again, creating these). At the tiny town's southern end, Minnehaha Street will bring you the closest to the behemoths, but then the famed arch disappears. The farther north you go, the more these change shape, and the more the arch becomes evident. At the town's northern end, the whole structure suddenly becomes skinny, like an old spaghetti western movie. Bayocean and the Spit. 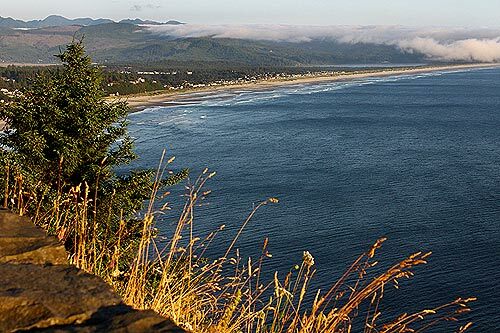 Head to the village of Cape Meares (not the headland), about nine miles west of Tillamook, and there's a wondrous little hidden spot. Enjoy the sandy solitude, which often features big stones and a forest of funky, faded logs. Some are even painted up in a whimsical manner. 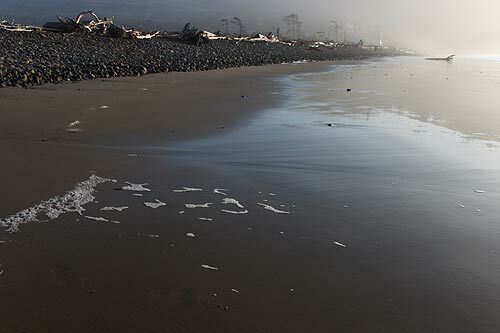 Or hike the seven miles or so of the Bayocean Spit and really find yourself in a blissful world all your own. Neskowin. 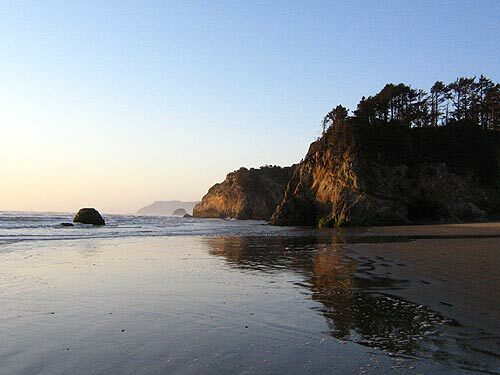 A few miles south of Pacific City sits the remarkable little village of Neskowin. There's not much in the way of commerce here, but that's the point. 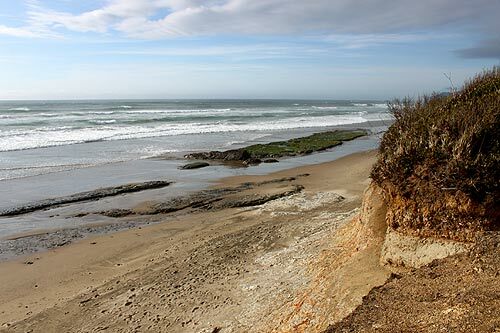 This is one bewitching little beach, with oddly thick sand grains and a few ancient secrets. From the main access, you'll see the blob-like Proposal Rock, which is one fun and fascinating feature all its own. Just beyond that, however, sit the mysterious Ghost Forest stumps – nearly 2,000-year-old remnants of a forest that was immersed abruptly and cut off from the decaying effects of oxygen. NW 26th Access at Lincoln City. 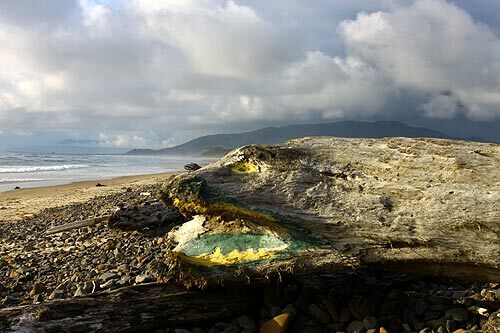 This central Oregon coast hotspot has an abundance of beaches to keep you enthralled in sand-induced fun time for a quite a while. The slightly hidden access at NW 26th is a bit different, however, and it can be a tad less populated. First off, there's a long, long stairway down to the bottom, which can admittedly be a bear to get back up. At the bottom sits the cement remnants of what must've been another stairway, which was likely ripped up by storms or cliff erosion. Otter Loop Road. Just south of Depoe Bay, Otter Loop Road veers off to the west of 101 and takes you on trippy but tiny road full of wonders. The rocky bluffs of Rodea Point and the viewpoints at the Ben Jones Bridge are some initial highlights, which then give way to slightly soaring vistas and dramatic, plunging cliffs. Then, you soon find yourself at breathtaking Cape Foulweather, sitting some 500 feet above the waves. 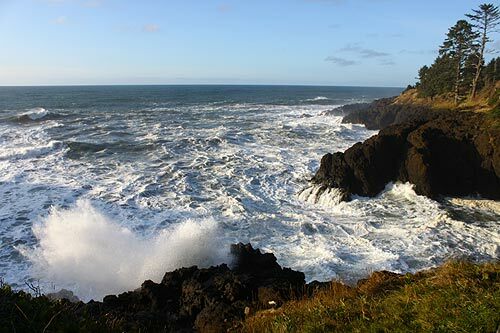 It's probably the most action-packed two miles of Oregon coast roadway there is. Moolack Beach, Newport. With parking lots perched above this sandy wonder just north of Newport, some accesses are easier than others. Some of the best surprises happen during winters (every few years or so), when not only is the agate hunting prime but you get 4,000-year-old stumps showing themselves. Year-round, however, these soft cliffs hide an abundance of wacky fossils.